Three weeks until The Aloha Classic 2018. 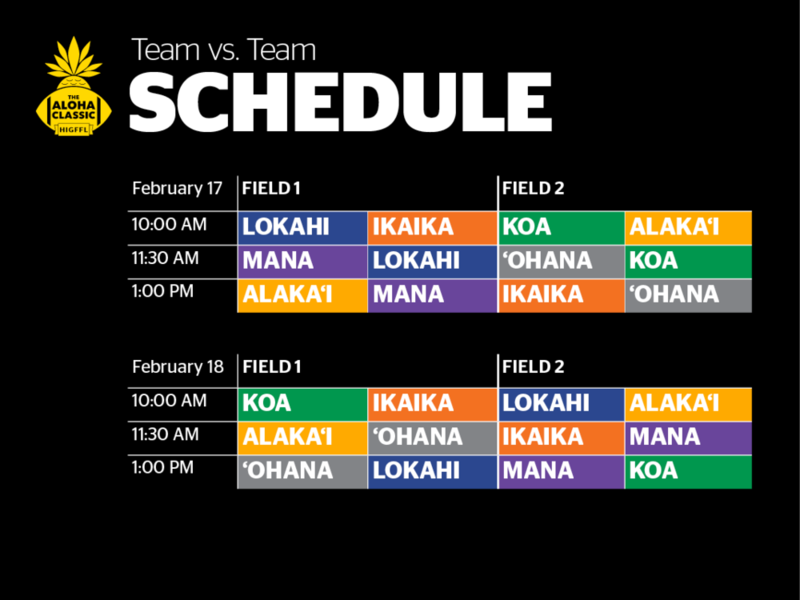 Each Aloha Classic 2018 team has a buddy team (a team they will not face-off against). The buddy teams play at the same times on different fields and share the same breaks. Team Lokahi (blue) and Team Koa (green) are buddies. Team Ikaika (orange) and Team Alaka‘i (gold) are buddies. Team Mana (purple) and Team ‘Ohana (graphite) are buddies. There is a downloadable pdf of the schedule at bottom of this post. Below is an image showing the schedule in a Team vs Team format.